Planning to elope in NYC? This guide contains all the essentials you need to know, assembled from over 8 years and 350 weddings as a New York elopement photographer. 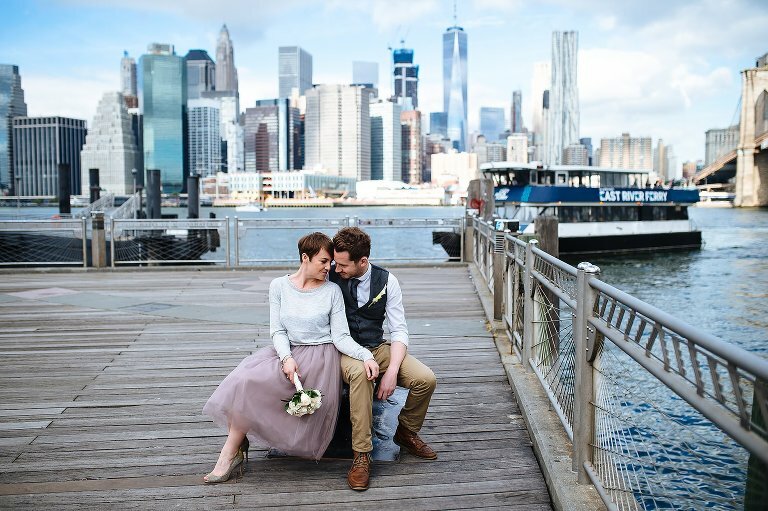 Everyone planning an NYC elopement is in for a treat: an easy marriage license process, a wide variety of amazing vendor options, and of course the city itself as the backdrop to your wedding day. There are limitless options for eloping in NYC, from having an outdoor Central Park wedding to hosting an intimate wedding at a landmark restaurant. When planning a New York City elopement you are free to create exactly the wedding day you desire. What follows is a guide for anyone looking to get married in New York in a unique and stress-free manner. Why should we elope in NYC? You’ll be eloping in an amazing city, and all that is has to offer is now at your fingertips to plan an awesome wedding day. The NYC marriage license process is simple whether you’re a local or planning a destination wedding. The wait period after obtaining your license is only 24 hours. You can extend your stay directly into an NYC honeymoon. 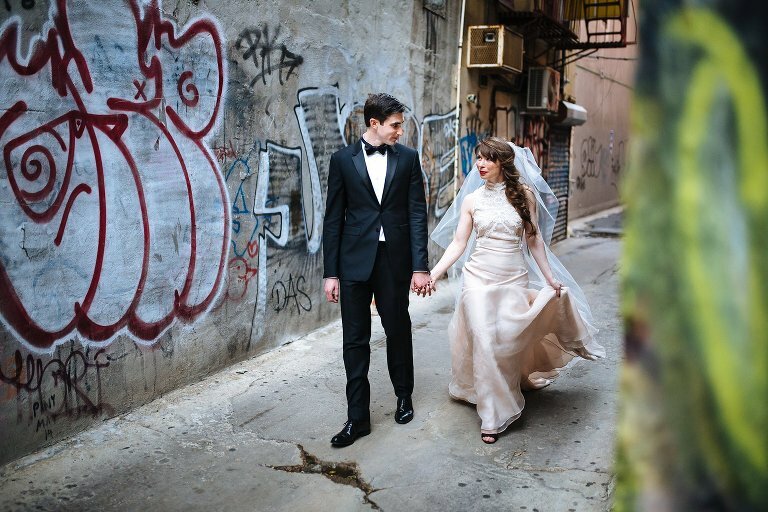 With a New York elopement, you can plan something simple or elaborate…it’s totally up to you! The first step to getting legally married is to obtain the NY marriage license. The City Clerk’s office, located at 141 Worth Street in Manhattan, issues the $35 license. While the Manhattan location is the most popular, you can get the license in any New York county including any of NYC’s other boroughs of Brooklyn, Queens, Staten Island, and the Bronx. You can save a little time by starting the marriage license paperwork online, but either way you and your partner must finish the process together in person. The City Clerk’s website contains more detailed NYC marriage license information. A full 24 hours after receiving your marriage license, you can perform your wedding ceremony. 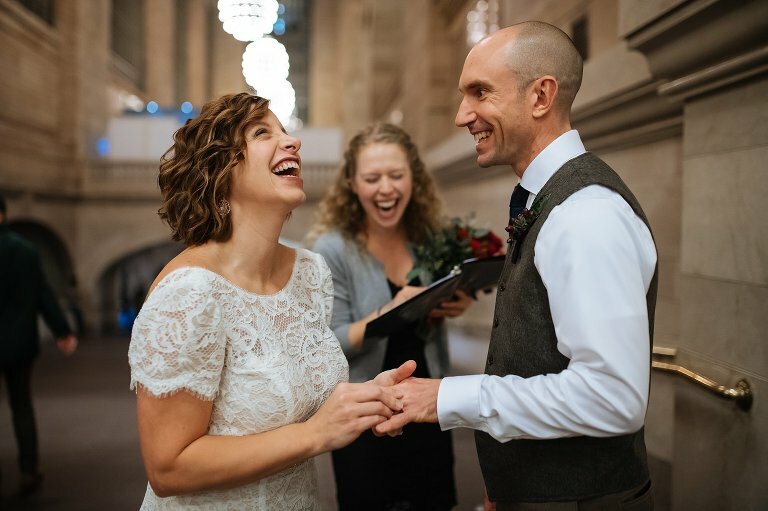 While most couples are opting to hire a private officiant these days, getting married at City Hall along with other couples from all over the world is still a great experience. You can get married anywhere in NYC, so why limit yourself to a City Hall wedding? You can be on The High Line surrounded by the fall foliage, amongst the skyline at 620 Loft & Garden, or celebrating at an intimate restaurant venue like Frankies 457. Hiring an officiant is the best way to craft a unique NYC elopement. You’ll be able to customize your ceremony with vows, readings, and other personal touches. Check out these tips for finding the perfect elopement officiant! Having a City Hall wedding is truly a unique experience. On any given weekday, couples from all over the world come here to exchange vows. The waiting room is a people-watcher’s dream and you can’t help but bubble with excitement as you wait for your number to be called. 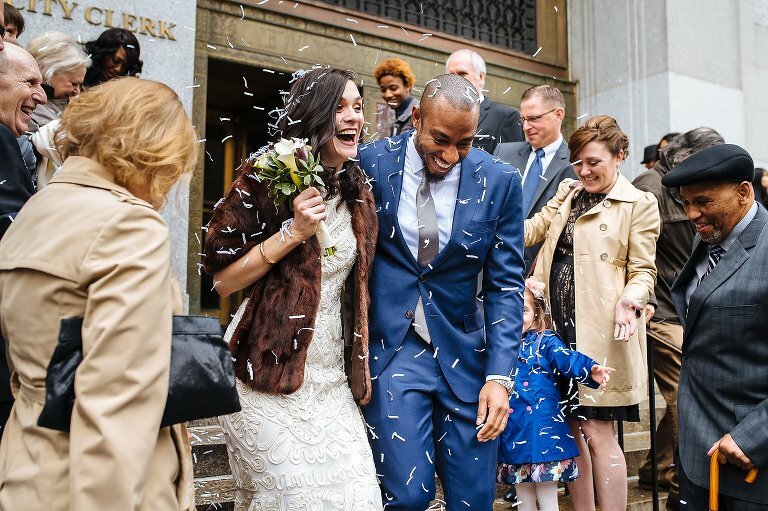 For NYC elopement couples that want an easy way to tie the knot, see my in-depth guide for getting married at City Hall. If you’re not a US citizen you’ll need to get an additional “long form” document after your ceremony has been performed. You’ll return to the City Clerk’s Office to obtain this and it will enable you to register the marriage back in your home country. If you’re from a non-English speaking country, you’ll also need to get an apostille. You can read more about the apostille at the Department of State’s website. Booking a Nice Hotel? Start Your Photos There! If you’ll be splurging on a swanky hotel when you elope in NYC, capturing photos before heading out the door is always a fantastic idea. Check out my in-depth guide on why getting ready photos still matter on an intimate wedding day. Spending a few minutes styling your details lends a high-end touch to the photography coverage, and arranging a first look allows me to capture the utter joy you feel when you see your partner all dressed up. Wondering where to book a stay? See my profile of three great hotels to stay in when you eloping in NYC. When planning a New York elopement, there aren’t any bad places to take portraits. It’s just about finding the side of NYC you want to have as a backdrop, whether that’s skyline or graffiti. But therein lies the problem! If everywhere is good, where should we go? The obvious locations are always popular — Central Park, Top of the Rock, Brooklyn Bridge Park, Grand Central, The High Line — and for good reason. They scream “we got married in New York City!” While it’s great to include the major landmarks, I encourage you to wander off the beaten path. A good strategy is to pick a neighborhood that has a certain vibe you love (eg, gritty hipster, classic architecture, or skyline views) and we’ll explore organically from there. After all of the official stuff is taken care of, it’s time to party! If you’re looking to host an intimate wedding reception there are great options throughout the city. You could get competitive over shuffleboard, take over a bar for drinks and dancing, or have pizza at a rooftop restaurant with skyline views. For a formal reception with meal and entertainment you’ll want to rent out a private event space like a restaurant or other intimate venue. This will allow you to set the mood, style the room, and provide your guests with an amazing celebration. Taking the subway or hailing a cab is for getting to work. To get around for your NYC elopement I suggest riding in a classic NYC Checker cab. Peter at FilmCars has a deep selection of classic cars, and his Checker cabs are a top hit. Riding around town in one of these babies is so cool, and taking portraits with it is a really special addition to any elopement. I highly recommend booking one! Planning your NYC elopement? Contact me today!